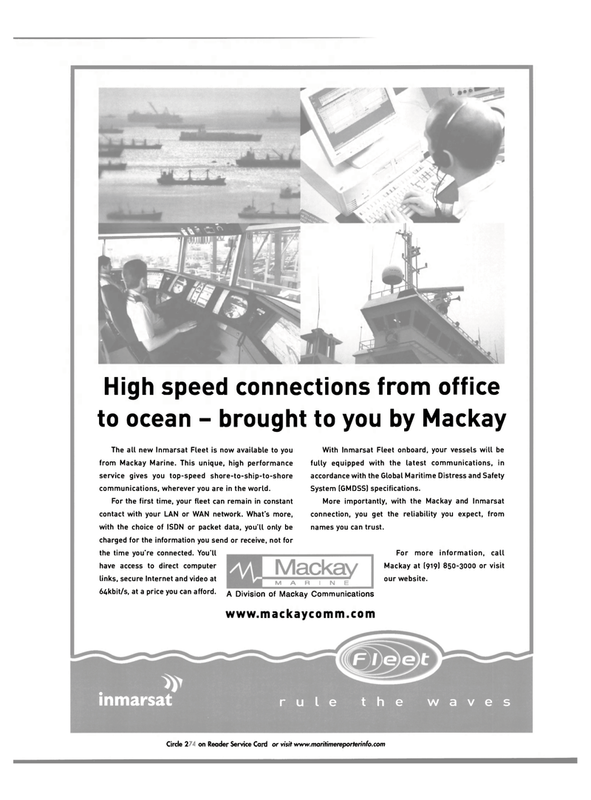 The all new Inmarsat Fleet is now available to you from Mackay Marine. This unique, high performance service gives you top-speed shore-to-ship-to-shore communications, wherever you are in the world. For the first time, your fleet can remain in constant contact with your LAN or WAN network. What's more, with the choice of ISDN or packet data, you'll only be charged for the information you send or receive, not for the time you're connected. You'll have access to direct computer links, secure Internet and video at 64kbit/s, at a price you can afford. More importantly, with the Mackay and Inmarsat connection, you get the reliability you expect, from names you can trust. Mackay at (919) 850-3000 or visit our website.